Line 9″ x 13″ baking pan with foil, and grease. Place cookies in freezer bag and crush with rolling pin, set crumbs aside. Grate lime peel, stir into butter, and remove from heat. Stir cookie crumbs into butter. Spoon crumbs into foil-lined pan, and press down by hand (note: pressing down crumbs with spoon failed, use hand). Bake 10 minutes and cool on wire rack. From lemons, grate peel and set aside, then squeeze juice and set aside. In a small bowl whisk sugar and cornstarch together. In mix master or large bowl, on Medium speed, beat cream cheese for 5 minutes. Use a flexible rubber spatula to scrape down the sides of the bowl constantly. One by one, beat in the sugar mix (adding a third at a time), followed by heavy cream, lemon juice, and lemon peel. It is important to make sure each ingredient is blended well before adding the next. Keep scraping down the sides. On Low speed, beat in eggs one at a time until just blended, do not over beat. Pour filling onto crust, and place 9″ x 13″ pan inside the larger pan to form water bath. Carefully pour hot water from the kettle into the larger pan, it should rise about halfway up the side of the small pan. Carefully lift large pan and place in oven, bake 50 minutes until just centre jiggles, then remove from oven and place on rack (turn off oven). 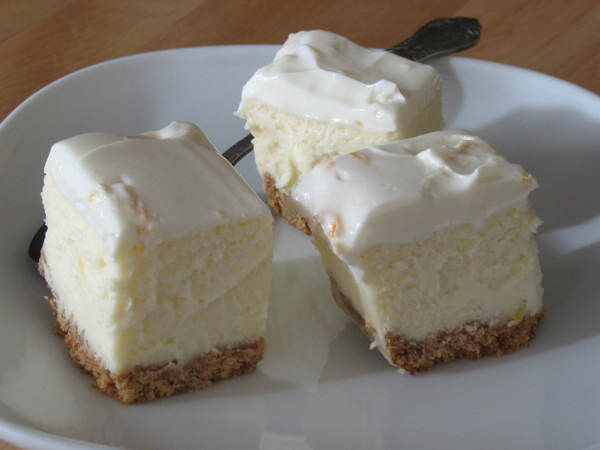 While cake is baking, make topping; in a small bowl stir in sour cream, sugar, and orange peel, cover and return to fridge. Immediately after removing cake from oven, spoon sour cream mix onto hot cake, use soft spatula to spread it evenly. Return cake to oven for 5 minutes (oven is off). Remove from oven and carefully remove the smaller pan (which holds the cake) from the large pan. Place smaller pan on cooling rack until completely cooled, at least 2 hours. Cover pan tightly with plastic wrap, chill in fridge overnight. In the morning, use edges of tinfoil to carefully lift the cake out of the baking pan, and use a hot knife to cut a few pieces, return remainder to fridge. Let pieces sit at room temp for 20 minutes before consuming.